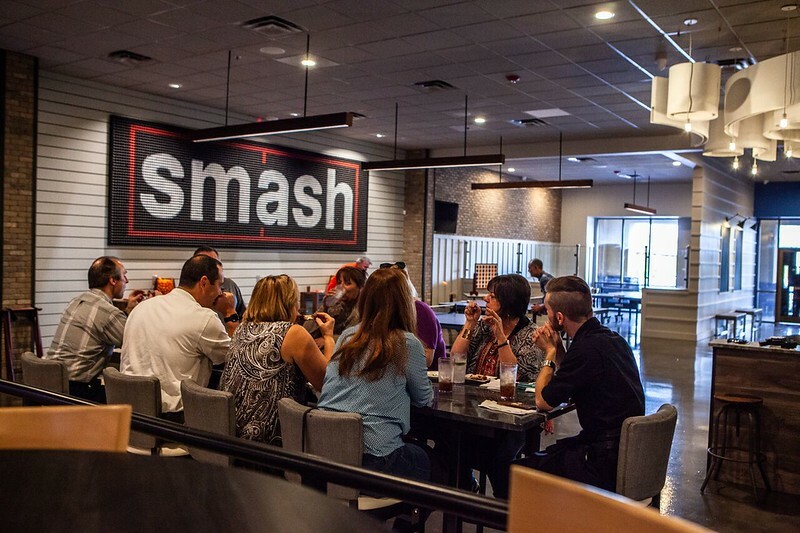 Smash is serving up an unusual combination of ping pong, upmarket dining, and drinks in Baymeadows. Similar ping pong clubs are opening up around the world. The leading company is SPiN, founded by actress Susan Sarandon, a chain of ping pong venues with a nightclub atmosphere that has several locations in major North American cities. 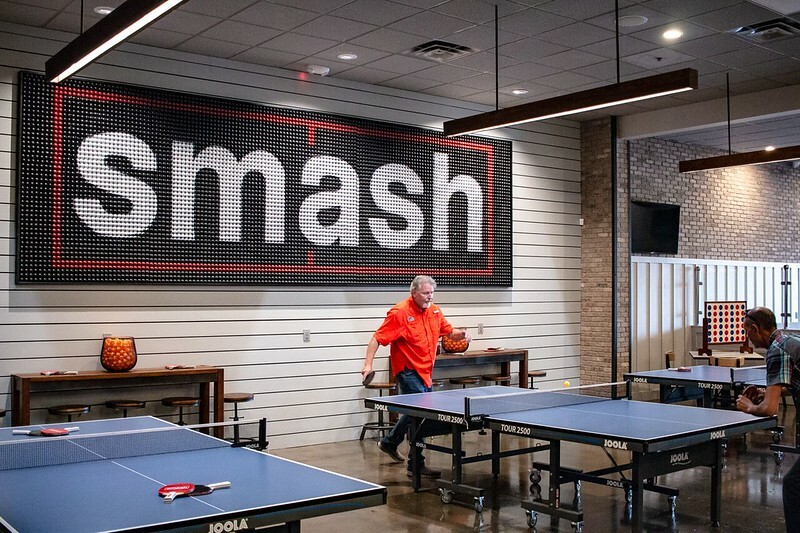 After visiting SPiN’s Toronto location, Smash’s owners were inspired to bring the concept to Jacksonville. They decided to do their own take on the theme, adapted to the local market and to the Baymeadows neighborhood. “We wanted to make it more of a family style, more of an upmarket restaurant environment,” said Cathey. The new venture is part of a national trend in renovating strip malls and shopping centers. With big box retail in decline, owners are looking for creative new ways to fill or reinvent their largest spaces. Smash, in particular, is taking over a 13,000 square foot space has lain vacant since the previous tenant, the erstwhile nightclub Pure, closed in 2015. Additionally, as Jacksonville’s food and nightlife scene grows, venues have to do more to stand out. 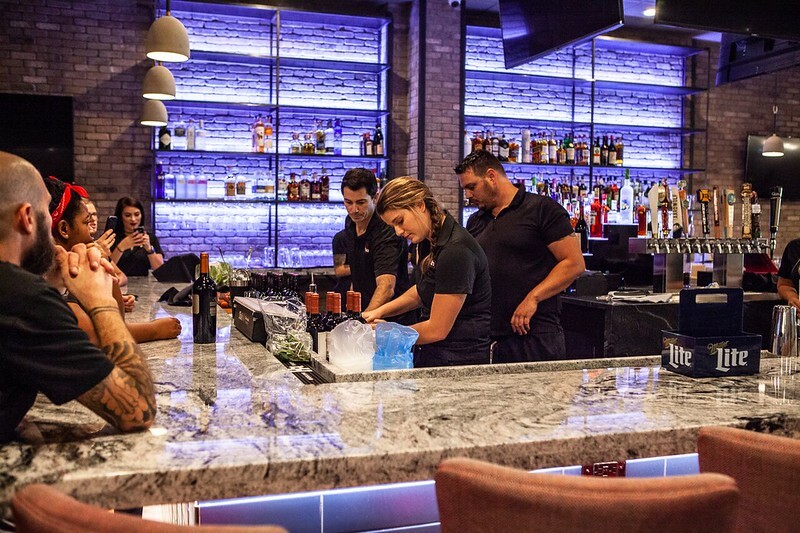 New and upcoming additions like Spirit Animal beer, wine, and dessert bar, the city’s three arcade bars, and the axe-throwing venue Class Axe are attempts to offer something customers can’t get elsewhere. Smash, then, is an ambitious experiment in market relevance. “We’re very keen on investing in Jacksonville, and giving Jacksonville a really cool place to hang out,” said Cathey. Executive chef Cathey is as unique as the business itself. He has been in the restaurant business since he was 15, working his way up from serving to restaurant management in his native South Africa. He subsequently studied to become a chef in Switzerland, which opened the door for ventures including his own restaurant in England, a catering company and restaurant in Cape Town, and, most exotically, a stint as executive chef at safari lodges around Kruger National Park. In looking for new work, the Catheys set their sights northward. “We wanted more of that Southern hospitality, that friendliness,” he said. They had heard good things about Jacksonville, and started checking out the listings. When the opportunity to be part of Smash opened up, Cathey jumped on it. 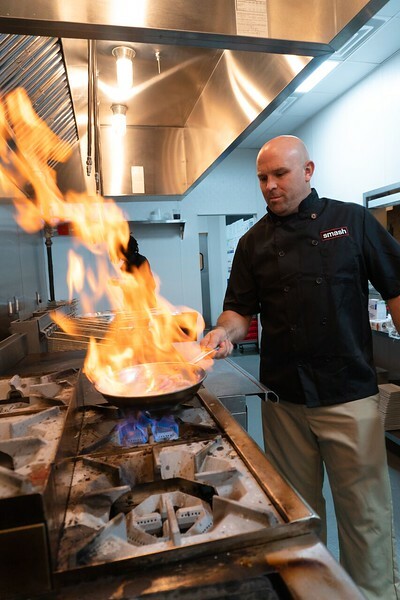 At Smash, he leads a staff of over 60, including a team of chefs who will serve everything from chicken wings to seasonal Mayport seafood dishes. There’s a heavy focus on local sourcing. “We’ve gone so far as sourcing U.S.-made cutlery and flatware,” he said. The extensive drink list includes specialty bourbons, wines, and twelve craft beers on draft, six of which will be local. The ping pong is no less ambitious than the kitchen. The space features twelve tables which can be rented by the hour or half hour. Those interested in upping their game can book lessons with Smash’s in-house ping pong pro, Jean-Marie Kanani. Kanani will also run Smash’s leagues. They plan on a Tuesday night social league, a Thursday night competitive league, Friday “Prize Nights,” and Sunday kid’s league. Ping pong rentals will come with food specials, and sections are available for group rentals and corporate events.